SpongeBob vs. 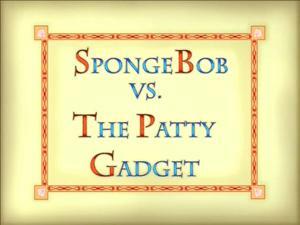 The Patty Gadget (Episode) – From SpongePedia, the biggest SpongeBob-wiki in the world! SpongeBob vs. The Patty Gadget is an episode from Season 5. It starts with Patchy opening the book, 'The Legend of SpongeBob SquarePants'. The story (in the form of a rhyming poem) then follows what happens in the book. SpongeBob happily works in the Krusty Krab kitchen, when Squidward walks in with a large machine made to cook Krabby Patty instantly. Mr. Krabs asks Squidward what the machine is, and Squidward answers, "A miracle, a marvel! It'll cook Krabby Patties at a fabulous pace!" Squidward wanted to trade SpongeBob for the faster and cheaper machine. Mr. Krabs is about to fire Spongebob, but SpongeBob then burst through the door, challenging the Machine to a cook off. After both have finished their first batch of patties, Squidward broke the machine's lever, causing it to malfunction. SpongeBob got the upper hand, with the Patty Gadget shooting out patties by 2s and by 3s until the machine exploded. As the crowd cheered, SpongeBob fell with exhaustion and he drops his spatula, making it seem like SpongeBob had died. The next scene shows a funeral with Squidward the saddest one there. Surprisingly, SpongeBob walks up to the grave and dances on it. This is when we discover that the funeral was for Squidward's machine, not for SpongeBob. Patchy then closes the book, ending the episode. This is the first episode to rhyme. Patchy did the most rhyming work. This episode is half as long as a normal one, so that 3 episodes could play. This episode is one of the only episodes to feature Patchy the Pirate's voice without him being on the screen. The rhyming is very similar to that of Dr. Seuss. This is King Neptune's season five debut. This episode marks another time SpongeBob competes for whoever makes the most Krabby Patties. This short episode is similar to the tall tale of John Henry, a story about a railroad man versus a robot that makes railroad faster, except for the fact that SpongeBob lives at the end. This is another episode with Patrick having a non-speaking role. This is another episode where Mr. Krabs joins in Squidward's plans against SpongeBob. It is unknown that the grave with Squidward's Hopes and Dreams in One Krab's Trash was the grave with The Patty Gadget. This page was last modified on 21 August 2013, at 18:14.